I've blathered on and on about accessibility in the past, but I feel there's merit to it. Accessibility is a term more than likely scoffed at by the underground music world, simply because it defines the concept of selling out. While some take risks stylistically, many are content to play a tried and true form of music that gives a quicker sense of gratification to its audience. This is an idea that shouldn't be mocked, rather, applauded. Like that hit song from the movie Hustle And Flow, it's hard out here for a pimp, or rather, for a musician (Or group of musicians, rather). Many wish to make a living doing what they do on stage, and who can blame them for trying to do it in a fashion that gets them there faster? 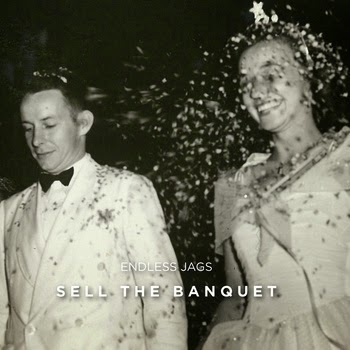 With Endless Jags album, Sell The Banquet, the group tries to slick things up a bit in this regards. Endless Jags are an alternative rock band, first and foremost, but they have an unmistakable varied approach to all their songs that put them all over the place comparison wise. That really comes out as their defining strength, ensuring things never get stagnant. "Surfer", the second track on the album, plays out like a Strokes song, though less low-fi. The jangly guitar playfully mixes with the never obtrusive drumming to complete a song that really stands out as their potential 'Single' on the album. "Seersucker" also draws comparison to another favorite band of mine, this time in the form of The Walkmen. From the vocals to the tinny guitar line, everything hear sounds like a Walkmen clone. If it's intentional, I'll still forgive them, because even making a track that can compare with an act like that deserves a pass in the judgement section. "Decameron", while being the shortest song on the album, displays the strongest overall effect. The bass takes center stage here, never going over the top in its spotlight, opting to work alongside the rest of the pieces to ensure the track stays catchy despite the time constraint and repetitious nature of its main verse. "Hexer", "The Loop" and "Boxcutter" all bring very strong additions to the album, particularly "Hexer", which cracks in at 6 minutes but never feels like it (Not to say long songs can't be great, but I'm a fan of the 2 1/2-3 minute track myself). It certainly stands out as the most 'Alternative' and feels like some long lost Hold Steady tune, slinging some distorted guitars our way that never go too overboard to make us feel like they're trying too hard to be commercially aggressive. And "Fifty Grand" pounds out a nifty ditty, placing high-pitched, but always melodic dueling guitar parts over the pacing drums. Not to go all comparative again, but it feels like a track Tokyo Police Club might have made. "Ready To Die" has a subtle emo quality to it that doesn't make it feel at home on the album. While "Ready To Die" is serviceable, it just feels lost thematically. While being constructed and performed well, when things go all over the place as much as they do on Sell The Banquet, it'd be nice to at least have all the pieces mesh well overall. "Next Summer On The Ice" and "The Great Resister" get lost on the album, taking a backseat to the others due to their general lack of enthusiasm. It's not to say they were made to feel that way, but there's a general lethargy in these two that don't match the other songs on the albums energy or bravado. Though I certainly nit-picked these guys with a string of cross-references, Endless Jags really took me by surprise. I'm sure the majority of the comparisons are coincidental, and the fact their songs can stand up to being associated with bands like those is a testament to their skill-set and craft as musicians. While a few of the tracks don't work, the majority do, and although their pallet is sometimes a bit too varied to complete and overall sound, it mostly doesn't matter, since these guys know how to make a great song. I just hope they can find the success they're looking for doing so. 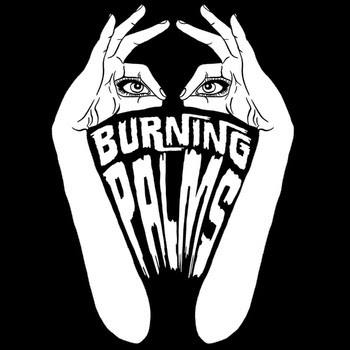 2013 was a lost year for me, but one of the lone bright spots was finding about Burning Palms. Hailing from Arizona, these guys blew me away with their polished and unique take on psychedelic surf rock, making me wish I'd refrain, if just for a second, from being anti-drug so I could consume some peyote and get lost in the desert haze with their music. So when I heard (Or rather, came across) the information that they recently released another album, I nearly tripped over myself in nerd like anticipation in order to listen to it. But what would I find? Would it further my opinion that these guys are one of my new favorite acts out there? Or would I find a pile of rubble, a ruined testament to what use to stand a once glorious group of musicians? Right out of the gate they emerge with a victory in the form of their opening track, "Young Hunter", which struck me as the theme song to some long lost drifter coasting along Route 66, his beat up convertible plugging along despite the desert heat. It has that twangy, but not overly reverb-laced guitar part that you've come to expect with the genre, and plugs alongside the drums that never are too invasive to take away from the melody. Following this gem is "Hologram", which emerged as my favorite of the whole album. I have a fondness for songs that are overly aggressive or out of place for a band that usually tries to be slightly more subdued in their sound, so I may be a little biased here. But "Hologram" is simple, and that simplicity is what makes it work, plugging away with a repetitive power chord infused guitar part that melds with the relatively quick-paced drums. "Pyramids" also brings the tempo up a notch, but it never manages to grasp the catchiness of "Hologram" though it's a solid track in its own right. They're a breath of fresh air on the album, and I mean that is the best way possible. It's nice to deviate from the norm every now and again, especially with music. "Thorns" and "Deadbeat Island" bring back the psychedelia, toning things down a bit but upping the atmosphere. "Deadbeat Island" plays things a little more subtly, but at a full minute longer than "Thorns" has more to do with it. The vocals really shine on this track, taking more command than they do on any of the other tracks, making it stand out for that reason alone. "Thorns" is ridiculously catchy, but it's short, and before you know it, is over. Once again, that idea of 'simpler is better' comes back into full swing with the instrumentals on this track, never indulging themselves into musical masturbation. Seriously, if people could only take a que from what Burning Palms does with their melodies, we might all be a little better off. "Church Of Ra" (Which is also the name of their last album) gets a little absurd from time to time, but builds up an energy and effective cool that keeps it briskly afloat. It has an early Stone Roses vibe to it, though that hallucination may be caused by the summer heat. "Thedious" also makes a name for itself on this album, combining the best of their easy-going and aggressive tropes to create a beautiful, but dangerous musical beast. The chorus on this song really shines, somehow eclipsing everything else and making them submit to its power. "Ajo" and "Dark Matter" round out the rest of the album, never really fitting in with the rest of the tracks though not really languishing with them either. They just don't feel as put-together as the others, and add a filler role to an otherwise spectacular piece of work. If there's a silver lining here, it's that even when Burning Palms produce a filler track, it's still better than 90% of the music other musicians considers their best work. Burning Palms is on-par with their last album, Church Of Ra, so it's easy to say this may be on my top ten list come the end of the year. It's hard to go into something with high expectations, because you don't want the band you've grown to love to let you down with your pathetic lofty needs. Thankfully, Burning Palms delivered what I would label as a 'must have' for your summer soundtrack, or any season soundtrack really. Just don't forget the peyote. Two piece bands have always fascinated me. Two piece bands that are husband and wife have fascinated me even more, not just because they're married, but because it takes a lot of cooperation and willpower to be in a band. Sure, you can attribute that to the whole 'marriage' thing, but believe you me, I've heard more people against the idea of being in a band with their significant other than for. That may have attributed to my appreciation for what Peridot was trying to do on their EP, Star Collecting. 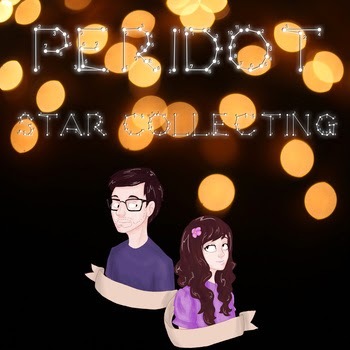 While initially feeling like a clone of Matt and Kim, Peridot quickly pushed that affiliation aside by being a little more dream-like in their pop delivery. "The Illusionist" feels like the most complete song on the EP, trudging along with a effective drum beat that never takes away from the melodic, but never over-zealous, synth line. It's a perfect definition of what these two are capable of, and if they harness that sound, can be for a long time. "The Philanthropist", is a little more subdued, but plays into a psychedelic theme that makes up for what it lakes in tempo. The vocals do feel a little loud and over-produced on this track, but Sienna Armstrong is at least a talented singer, so there's not much room for a complaint here. "Peoplespeak" has the most prominent and enjoyable synth part on the entire EP, it's just a shame the track wasn't able to get a little more out of its drums level wise (The actual playing of them is fine, though). It does feel like they took the most time with this song, constructing something that plays into a familiar hand, making their sound more accessible to others. "Sad Girls" and "Pinnacles" are both more somber in their approach (I mean, come on, the songs called "Sad Girls" afterall), and while they don't really leave much of a lasting aftertaste, they do show the groups range and potential for variety. And lastly "Ghosts", the second track on the EP, gets a nod due to the fact that it felt like a long lost Portishead song, or at least a long lost one they made when they first started out ages ago. Star Collecting grew on me as I listened to it a second time, mostly because I could see what they were trying to do and what they were capable of becoming. The mere fact I tapped my feet to some of these songs is a testament to their ability to craft a catchy tune, and that's no easy feat in this day and age (Just with me though. I'm a bit of a foot-tapping prude. Also, that wasn't mean to be a pun). I just hope they harness their sound and make it grow next time around. We'll all be in their debt when they do. Familiarity is a sin in the musical world. It's not one often talked about out loud, but in the dark corners, basements and dungeons of the world (We still have dungeons? ), hearing the same musical stylings over and over again can drive even the most lenient of fans insane. It's not that they want to despise a band, but it's hard to like them when they're doing the same thing everyone else is doing at the moment (Think autotuning). However, some bands are safe from the vitriol other acts face in this respect simply because they have that certain special something (I think it's called musical ability). The Philter, thankfully, appear to have that. 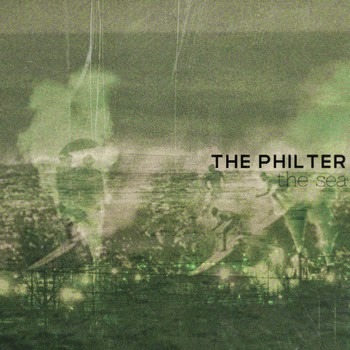 The Philter play a more drone-like version of surf-rock, firmly entrenching themselves in the popular genre that has seemed to get more over-saturated by the day. The opening track, "The Sea", doesn't really break new ground here, but it doesn't have to. It's catchy, but simple guitar riff (Which is any surf-rock bands bread and butter, really) cascades itself through the track effortlessly, giving it a catchy vibe I initially didn't think possible. "The Roses", the fourth track on the EP, also stands out with it's quick-paced tempo and its guitar riff that sounds a bit too similar to The Misfits "Some Kind Of Hate" (But, really, what chord progression hasn't been recreated at this point? There are only so many strings/chords on a guitar). It gets a bit sluggish at times, but still comes out in the end as a solid track. "Broken Wrist" is an interesting track, simply because it tries a couple of head-scratching combinations that work in the end. While it goes for the more psychobilly approach musically, there's a low-fi electronic vibe that settles itself into the background somehow, managing to blend the two seemlessly together. It's not a perfect match, but the fact that it works is testament to their creative juices in the first place. The last two tracks on the EP, "Saturday Night" and "Collapse" are more filler than anything. "Saturday Night" isn't a poor song, but it just doesn't have the passion the other more rock inspired pieces had, and it's slow paced nature doesn't mesh well with the overall vibe these guys seem to be able to produce. "Collapse" though, seems like a bit of a mess, blending the surf-rock vibe with what feels like 90's pop music. An airy piano part rings over the echo-laced guitar riffs, leaving us more confused than anything as to why they didn't know what they were doing. The Sea is not a bad EP by any stretch on the imagination, but it hardly does anything new. Thankfully, some of the songs are catchy enough to save it from truly bursting into hellfire, and really, when they're doing what they do best, they do it well. Just don't expect them to wow you into thinking they're groundbreaking. Hey guys, Shane from ESTSTM here. I've been away from this blog for a while now. I hope people still find the time to read it, but since it hasn't been updated in over 5 months (Yikes! ), it may be a tall order. Thankfully, the problems I've been dealing with for the last 8 or so months have finally been vanquished, and I can now take the appropriate time to update this blog again. Hope you are looking forward to the updates as much as I am, and thanks for your patience!